Design the Next JE T-Shirt. Are you a student? Will you be traveling with Joshua Expeditions during the 2016-2017 school year? Would you like to win a $1000 scholarship towards your JE Tour? If you answered “Yes” to all three of these questions, listen up! As part of traveling with JE, each traveler receives the JE T-shirt. Typically, one of our staff members designs a new shirt each year, but we thought it would be way cooler if one of you designed the shirt for the upcoming year. That’s right, every JE traveler will be wearing your shirt! 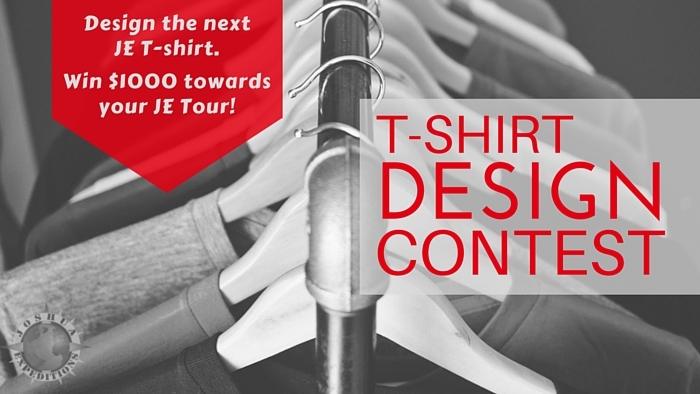 And to make it that much sweeter, we’re offering a $1000 scholarship towards your JE Tour should your design be chosen. See “The Details” below for the contest rules. We know there a bunch of creative minds and talented artists among our travelers. Let’s see what you got! Participants in the contest must be actively enrolled students, planning on taking a JE Tour in the following school year. To demonstrate eligibility, provide the Expedition Number and Destination(s) of your tour. You may only submit one entry. Designs can include up to 3-colors, not including the base color of the shirt (which you may suggest), and must have the name “Joshua Expeditions” on it somewhere. Use of the following slogans are permitted: “See the World. Make a Difference”; “Inspire Purpose, Develop Leaders, Share Christ.” These are not required. You may use whatever (appropriate) language and slogans you like that you find to be representative of JE. Should you wish to include the JE Logo, you may download that here (color) or here (black and white). If you need another file type for your design (e.g., an .eps file), you may request such. Your design may be front only or both front and back (not back only, however). Make sure to upload your design files accordingly. Designs should be submitted on a white or transparent background. Your design must be submitted in one of the following formats: .png, .tif, .jpg/.jpeg, or .eps. You may choose to upload a preview of your design on a T-shirt. Various T-shirt printing companies allow you to do this on their site by uploading your design and downloading a preview of that design on a standard T-shirt. Other trademarked slogans or logos are not allowed. Submit your contact information, eligibility proofs, design(s), explanation of your design, and any questions in the form below during the Contest Period (see above). Be sure your explanation not only describes design but also covers why you believe your design captures the essence of JE. All designs will be considered the property of Joshua Expeditions and may be used by JE in any way deemed fit. The winner will be announced on social media and the JE website. The winner will receive $1000 towards his or her JE Tour. This scholarship applies only for tours that travel between August 2016 and July 2017. Should the winner cancel his or her JE Tour, this scholarship will be considered void. In such a circumstance, JE retains the right to utilize the winning design. The winner will be notified via email. As such, it is essential that participants correctly fill out their contact information. JE is not responsible for any incorrect information or files submitted, whether the error is human or technological. JE is not responsible should participants experience computer-related issues after downloading materials for the contest or submitting their information and files. JE reserves the right to cancel the contest if unforeseen circumstances should arise and to disqualify any participant who does not follow the previously stated rules, including but not limited to submitting multiple entries and using trademarked material. For the past 10 years, we have awarded over $150,000 in scholarships to JE student travelers who display a desire to make a difference while on their tour. Read below to make sure that you meet all of the requirements, and send us your applications! 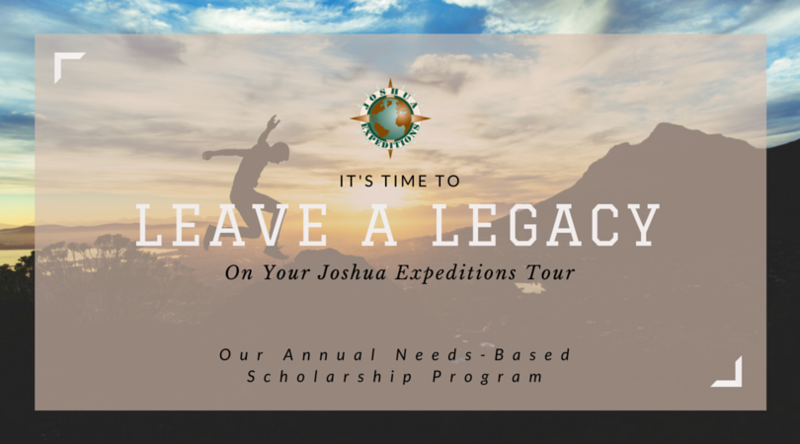 The “Leave a Legacy” scholarship program is open to any student registered for a Joshua Expeditions tour during the current season. Scholarship awards will range from $300-$1200, per person. Each season’s recipients will be chosen based on the level of financial assistance needed. If financial assistance is needed, the student should apply for a scholarship immediately after submitting their trip application. The scholarship application must be sent no later than 60 days after the student’s trip application form and deposit have been submitted. Scholarship funds are awarded on a first-come first-serve basis. Fully complete a “Leave a Legacy” Scholarship form and in an essay of no more than 400 words, describe how you plan to impact the world for Christ while on your Joshua Expeditions journey. Submit your essay with a completed scholarship form* to the offices of Joshua Expeditions no later than 60 days after your trip application form and deposit have been submitted. One application per person. Complete application packet must be submitted by postal mail or fax. *Please Note: Official entry forms will require tax information as proof of financial need. All tax documents will be kept confidential. **See complete terms and conditions below. The “Leave a Legacy” scholarship program is open to students traveling with Joshua Expeditions. Employees of Joshua Expeditions (and their immediate families and household members) are not eligible. To apply, a student must complete the official entry form, including financial information, and submit a typewritten essay of no more than 400 words on the specified topic within 60 days of submission of the student’s trip application and deposit. By participating in this program, all travelers grant permission to Joshua Expeditions for use of their essays in future promotional and organizational materials, including but not limited to travel brochures, print marketing, website pages, and social media. Joshua Expeditions will select the winners based on financial need and written essays. All decisions made by Joshua Expeditions will be final. The odds of winning will depend on the number of eligible entries received by Joshua Expeditions. Due to the volume of submissions, only scholarship winners will be notified. The “Leave a Legacy” scholarship awards will automatically be applied to the winners’ accounts for their Joshua Expeditions tours. Winners will be notified by e-mail. If you are awarded a scholarship, scholarship funds will be applied once the traveler has paid their portion of the trip balance in accordance with the payment due dates. Scholarship recipients are expected to follow the scheduled payment due dates to cover their portion of the trip costs to avoid late fees and penalties. If you do not receive an email indicating that you have been awarded a scholarship, it is your responsibility to follow the scheduled payment due dates to avoid late fees and penalties. The Joshua Expeditions “Leave a Legacy” Scholarship is void where prohibited or restricted by law and is subject to all Federal, State, and Local laws and regulations.